By Christian Takushi, Macro Economist & Geopolitical Strategist, 22 Oct 2017 – Switzerland. The world’s third largest economy elected a new parliament and government today after Prime Minister Shinzo Abe had called for snap elections. 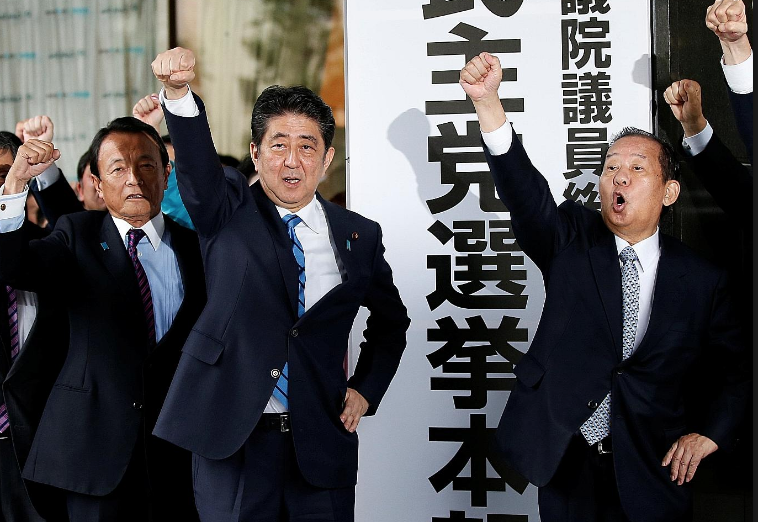 His conservative party (LDP) and the religious Komeito Party won a surprisingly solid mandate to implement a more assertive Foreign Policy and adapt the Pacifist constitution to address the growing security threats in East Asia. Abe swept the vote by betting on a very conservative pro-military course and by embracing suburban-rural Japanese. It was not a win without anxiety, he risked losing the more liberal, left-leaning and Pacifist big city dwellers. Western political leaders and economists looking to Japan .. There are obviously some unique cultural characteristics that play in Japanese politics, but I want to assure you that as a person of Japanese descent (my father is Japanese), I am aware of how Japanese culture differs from Western culture. And even from Asian culture for that matter. We should expect that Abe’s impressive victory will get the attention of many political strategists in the West. Many will try to do as if Abe’s landslide victory were a pure Japanese affair, but time is not on their side. 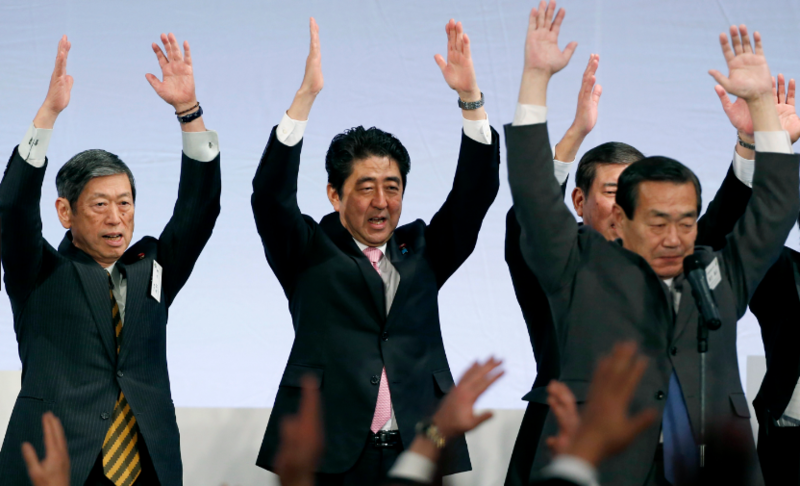 Abe is putting a question mark on one of Europe’s most widespread political rationales. He is a conservative, not a populist. His party’s name is Liberal Democratic Party, but the LDP is clearly to the right of May’s Conservative Party and Merkel’s CDU. Worse even, Abe stands for free trade, but not at the price of political sovereignty. Abe could be copied in Europe, and even improved: Austria’s Sebastian Kurz “ticks most boxes” and he is charismatic. In less than two weeks the political world has been shaken – it has had to deal with Sebastian Kurz and Shinzo Abe, two non-populist conservatives. They pose a threat to the notion that there is no alternative to the centrist-liberal Policy Mix in place for over three decades. 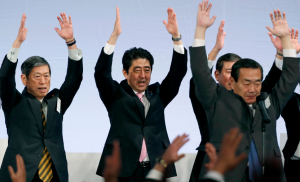 How could we best depict Abe’s coalition to Western readers? Imagine it rather as the CDU/CSU in Germany not only staying on their conservative course since 2012, but shifting further to the right, protecting traditional values and making Security their overriding priority. Kurz’ ÖVP in Austria is probably the closest existing European Party to Abe’s LDP. Japan politics poses some tough questions for Europe, because the formerly conservative parties of Europe shifted to the liberal center long ago. A process that was only accelerated by BREXIT – All established parties understandably rallied behind the EU project to save it. But clustered around the liberal center, they have to make an effort to differentiate themselves – thus, becoming vulnerable to new parties and movements. But Japan politics will also raise questions in Washington – how could Abe’s coalition with so many divisions and factions stand together despite a not very charismatic leader? If the GOP cannot deliver a Tax Reform it might face a rude awakening at the mid-term elections 2018. That may also come if moderate Democrats and Republicans join forces to pass it. Which is in my humble assessment Trump’s preferred option. EU vs Japan: Comparing GDP per capita. Japan may be turning out to be the most stable G7 nation – And let us not belittle the stagnant GPD growth. GDP data can be used in a misleading way. If you look long term and take into account its shrinking population, Japan surprises positively. 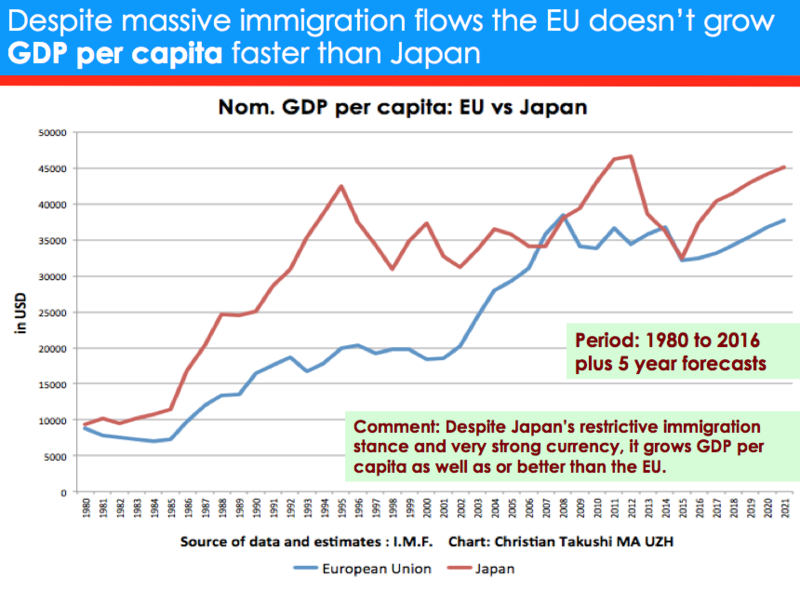 The EU GDP per capita has failed to outpace Japan’s despite the mass influx of immigrants and despite Japan’s massive currency appreciation since 1985. Today’s political shock from Japan and the campaign that preceded it pose uneasy questions to politicians and economists in Europe. Could it be that the 4 decades long Policy Mix was right, but needs some adjustment? Or has it run its course? It is an avoided topic that may be only growing the quiet distrust to Brussels’ stance on mass immigration as the only way to sustain economic growth: Why can’t the EU clearly outperform a G7 economy that has gone through a brutal currency shock and is controlling immigration? Is the growing GDP generating enough spillovers to cover all the costs? I support no ideology; as an analyst I pose questions I deem “overlooked”. But I can admit that I am sympathetic of immigration, because my forefathers and myself have migrated. As such, I feel Brussels’ refusal to put all the facts on the table and to separate illegal from legal migration may be backfiring, and even feeding the very far right movements it fears. Mrs May’s strategy since she called for snap elections was almost opposite to Abe’s: A tough course in dealing with political allies and foes at home, but a zig-zagging course in Foreign Policy. She played a conservative tune to pro-Brexit voters, a liberal tune on other key issues, and would make stern speeches on Foreign Policy only to bow to the retaliations coming from Brussels. She hardened her stance only after the Catalonia crisis weakened Brussel’s resolve. Trying to steer to the Liberal-Center camps while making promises to Conservative-Right constituencies did not work for May in Britain, neither did it work for Merkel in Germany in 2017. Shinzo Abe has achieved a tremendous victory, rare for an incumbent head of state among the 7 most advanced economies of our world. What did he do that stands out? Rather than betting on the big cities and their values, Abe bet on suburban and rural Japan. Similar to what Donald Trump did in 2015-2016. A very risky move, since this allowed the more charismatic Mrs. Koike to attract Tokyo and other big city voters in recent months. A few weeks ago she shot up in the polls, and many observers predicted she would unseat or shatter Abe today. In the last days Abe was able to carry the momentum into the big cities. Abe focused on one issue (one only). Against the advice of domestic and foreign experts turned advisors – who suggested he focuses on the huge government debt and stagnant salaries, Abe followed his instinct and his Security Council: the geopolitical-military threats to Japan’s existence. He sensed that Security was the overriding issue, and that economic prosperity could only be served if security threats were addressed. With all his energy focused on the growing threats to the Security of Japan, he steered an unwavering unapologetic course. The result, a tough Foreign Policy of more military deterrence, more support for strategic allies and more ambivalent threats to China and North Korea. Not only was the silent rearmament of Japan to be stepped up, the Self-Defense Forces needed to be given more leeway to meet threats more effectively: earlier and abroad. He smartly kept Russia out of his security focus. Following a “You have to know who is your top strategic enemy”, so Russia was offered ambivalent hope and more dialogue. He did not downplay the economic problems. The six consecutive quarters of economic growth and stock market gains have not been felt by all Japanese. Abe resisted the pressures to fill the growing job vacancies with much more foreigners. The implicit message: Tokyo is probably the safest big city thanks in part to high social cohesion and a very rigid immigration policy. The truth is, the government is very gradually taking in more foreigners, but only at the rate these can be screened and surveilled – with little information given to the media. In a nutshell, Abe and his allied Religious Party Komeito steered to the “right” and subordinated all other issues to National Security in all its different aspects. Abe’s conservative-religious coalition won a mandate to lead Japan into 2021 by risking to alienate “center” voters to the highly popular Koike. The following weeks we shall analyse data that shall help explain why Koike failed to sweep Osaka, Nagoya and other city suburbs. The city suburbs seem to have decided the Japanese elections, just as they swayed the US elections. Today’s results do not reflect the openness and risks of this race. Koike launched an all-out assault to win voters on the left and center. She even announced flying to Paris this weekend – before elections would be ratified – to attend a Climate Conference. She wanted to send the message that Climate Change is the real issue of our time. Like Mrs. Angela Merkel, Mr. Shinzo Abe is about to become the longest serving head of state of a G7 nation, but while she steered clearly to the liberal center, Abe has steered to the right. Abe’s course is not without risks though. The LDP may be right about the growing threats by China and North Korea, but the growing proximity of the government to the fast-growing Defense Industry and the reinvigorated Japanese Self-Defense Forces runs the risk of giving too much power to military leaders with political ambitions. This is after all post-war Japan. So far this risk seems to be contained, but diverse Asian neighbours see this with more hesitation. Japan’s military leaders are for the most part detached from politics, but this was the case during the wars that Japan fought against Russia and Korea. The proximity and growing collusion turned quickly into a political movement as soon as the external circumstances shifted in their favour. Thus, Asian neighbours are not taking the current situation as a guarantee. Having said the above, every country and every election is different. The Japanese public showed a higher tolerance for placing Japanese interests over that of immigrants – Unimaginable in Britain. Japan has also pursued trade expansion, but not at the expense of national sovereignty. The threats to the national security of Japan are currently far greater than Britain’s, while London is becoming one of the most vulnerable big cities (among the G7) to terrorism. Last but not least, unlike Japan, minorities with immigrant background play a role in British and German politics. Who is the main geopolitical beneficiary? The biggest beneficiary is the USA: President Trump, his National Security Team and the Pentagon have secured a committed ally to advance US interests in the Pacific. Tokyo will also commit more money for mutual defence goals, and this will allow the USA to put more pressure on the EU. Abe had steered in this conservative-nationalist direction in recent years already, but only gradually. Trump and Abe are very different in style, but they share some common ground: National interests first, deterrence through military strength and proximity to conservative religious circles. The US military complex will also benefit – their close cooperation with Japanese heavy industries will only intensify. Taiwan and South Korea will also benefit. Taiwan is under the official Military Shield of Japan. This will allow the USA to provide more support to Taiwan via Japan without antagonising China. Despite the zig-zagging course of South Korea’s president to the North Korean leader, the South Korean military is working ever closer with Japan and the USA to deter the North. South Korea does not only enjoy the protection of the USA, it also is increasingly enjoying the de facto support of Japan. Very few in the West comment about it, and they cannot be blamed, because even Japanese observers are cautious on it: Japan is rearming and preparing for the imminency of military conflicts and new security challenges. This will only accelerate in the coming years. Key US, Japanese and Australian military commanders seem to agree on the growing threats. China, India and Russia along other rising powers are preparing for the interruption of important trading routes and geopolitical conflicts (including war). Are European leaders missing something or are they simply lacking strategic foresight? Europeans can only hope it is not the case, because the EU dismantled its strategic military forces over the past two decades just as it embarked on a relentless territorial expansion into the East. European leaders complain about the rise of Russia’s nationalists, but they overlook that the EU/NATO expansion was a key factor that aided their rise. Without Britain, the EU’s only credible forces are agile brigade-size units. Most divisions exist rather on paper than in reality. It took France multiple days to mobilise 3’000 troops after the Paris terror attacks. The EU wants to rearm and has begun to do so. But a credible military deterrence will take at least 7 to 10 years to be achieved. It is during this period that the EU remains vulnerable and highly dependant on the more credible nuclear-conventional deterrence of Britain and the USA. Japan’s bold mandate today will further expose the asymmetric nature of NATO. The USA can defend the EU, but the EU cannot even defend herself effectively. Christian Takushi, Macro Economist & Geopolitical Strategist, 22 Oct 2017 – Switzerland. General Disclaimer for all our research: We provide geopolitical-political analysis only. Global Geopolitical Macro Analysis is highly complex and subject to sudden changes. No analytical method is without certain disadvantages. We may change our outlook within less than 3-6 hours following an event. Global Geopolitical Macro Analysis can be extremely time-sensitive. No comment should in any way be taken as an investment advice or suggestion. One and the same assessment at the geopolitical or macro level can lead to very different rational actions, because every nation, company or portfolio has different risk tolerances, assets, goals and restrictions.